Description of "Old Traditions Enhance Modern Life"
This book is a toolkit for those who seek answers to the question of how, old traditional customs can enhance their lives in this modern day and age. On a day to day basis we do a lot of things that have been followed for generations without questioning them or even trying to understand their significance. In particular, this book focuses on the tradition of celebrating Navratri and worshipping the nine goddesses. The Nine goddess represent the nine steps in a ladder that every person has to tread in order to achieve their ambition in life. This ambition could be a practical one or a spiritual one, the steps remain the same. 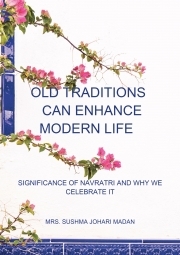 This book simplifies the relationship between our goals and our traditions and attempts to answer the questions on the significance and practical reasons for following the old custom or tradition of celebrating Navratri. Sushma Johari Madan is the youngest daughter of Shri Banke Behari Lal Johari and Mrs Taradevi Johari. Since her childhood she has been interested in the art and artistic activities; she is also proud of having been part of a family-blessed with traditional values and, spiritually advanced parents ;Her eldest brother Harish Johari was a renowned Yogi, Artist, Philosopher and writer of several books related to Indian culture, Ayurvedic way of life, meditation, tantra etc; Her brother Suresh Johari was a highly skilled artist and sculptor; Sushma’s growing up with such a family parents and all brothers and sisters taught her the truth of life from an early age, apart from the training in arts and sculpture. She graduated securing distinction in drawing and painting . She has been gifted with the power of empathy; She can at once feel one with whomsoever she meets in her day to day life. She believes in family bonds and has always tried to build and maintain harmonic relations between the members of her large family as also with friends and everyone she came in contact with Sushma loves to explore with all types of art forms ranging from drawing and painting simple objects to making complicated sculptures of Indian Gods. Sushma believes that you can never stop learning. Reviews of "Old Traditions Enhance Modern Life"